Our stylists are skilled at finding the looks that are perfect for you. They listen to your needs and build complete outfits that fit your personal style. They have a knack for finding pieces you never knew you needed and now you wonder how you did without them. My favorite thing about working at Brittany is meeting new people and working with my fun-loving coworkers! I enjoy creating a unique style for each woman that walks in, whether it be for a special occasion or simply an outfit that she can wear everyday & feel confident in. I would consider my style to be chic, elegant & classy but I’m not afraid to incorporate new styles, trends & bright colors. I love adding a pop of color with fun accessories! I believe one thing every woman needs in her closet is a black dress or black pants. Something she can wear casual or dressy and can take her from daytime to evening. I create my lifestyle by always shopping for the next new piece to add to my wardrobe. My mood and the weather both dictate what I’m going to buy. I always practice and remind myself “shopping is retail therapy”! My favorite thing about working at Brittany is helping a customer find just the right style for them. I love seeing a customer’s eyes light up when they find “the one,” it’s a wonderful feeling! I would describe my style as classic and comfortable. I love soft fabrics! One closet staple I believe every woman should have is a classic white blouse. It’s easy to dress up or down. I create my lifestyle simply. I buy really good quality basics and then add fun pops of color with tops, jewelry, and/or shoes. Doing this, you’ll always be in style! Working at Brittany has been a new experience for me! I love learning about fashion and helping our amazing customers along the way. My style is all over the place! Luckily, working at Brittany helps me dress for any occasion with style. I think everyone should have a great fitting pant. This should include a black, brown, and white pair. This will be a lifesaver when traveling! I create my lifestyle by living it to the fullest! I love staying active by playing golf and doing fun activities with my grandchildren. My favorite thing about being a stylist at Brittany is meeting new people and helping them select clothing they feel good wearing. My style is more casual but stylish at the same time. I like to dress up my classic pieces and then add in some trendier accessories for an impact. One closet staple item that I think every woman should have in her closet is a great fitting pair of blue jeans. I create my lifestyle comfortably and stylishly. 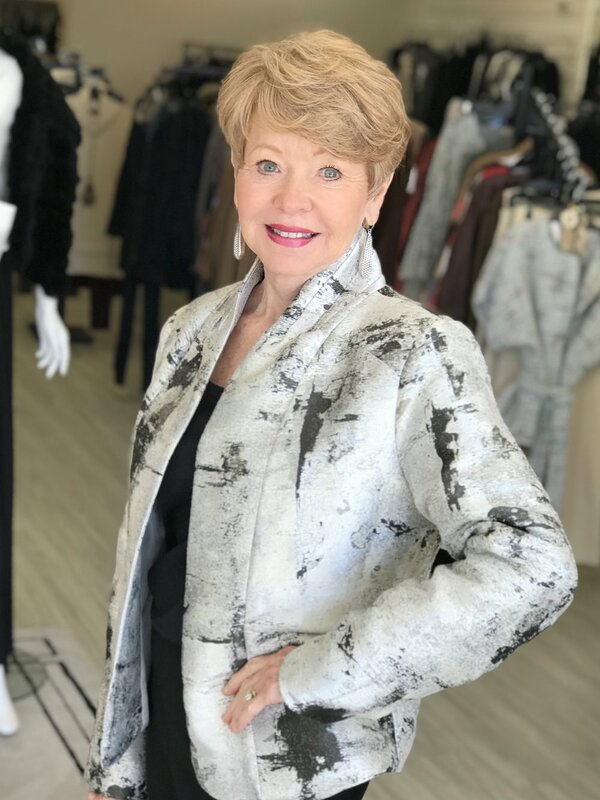 I’m always on the lookout for new and interesting pieces to add to my wardrobe whether it’s earrings, a necklace, a belt or just a fun new blouse. My favorite thing about being a stylist at Brittany is the fabulous customers I get to work with. They brighten up my days and I look forward to coming to work every day thanks to them and my sweet sister stylists! My personal style is comfy, casual, and fun! I love to get all dolled up and dress on trend, but no outfit makes me feel more myself than a great pair of Spanx leggings with my favorite tee! Every woman needs two things - Spanx leggings (my favorite is the faux leather!!) and the perfect pair of mules. Sam Edelman is my go-to. I create my lifestyle by shopping for the perfect core pieces. Give me the perfect pair of jeans and a white tank and I have my canvas to add in the latest trends of the season. The key is to invest in your core pieces and make them last for years to come! My favorite thing about working at Brittany is when I get to help the mother of a bride or groom! I LOVE helping them find the perfect dress for the best day of their child’s life. I would describe my style as Boho-Chic. I enjoy wearing unique and colorful clothing as well as simple, classy clothing. I think every woman should own a big, funky pair of earrings. Earrings can add that little extra flare you need to turn a simple outfit into a fun one! I create my lifestyle by competing in pageants and modeling in Atlanta. I’m always on the go! I also enjoy organizing and practicing for events. I love what I do and I wouldn’t change it for the world!